For good germination results, fill your containers with a light soil mix that has good drainage and moisture retention properties. Potting soil is best for this. 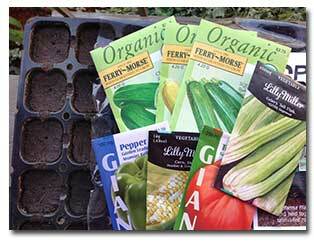 Make sure to wet your soil mix and allow it to drain before sowing the seeds into your containers. Find a warm location in your home with plenty of light, or an area where you can mount a light above the plants. 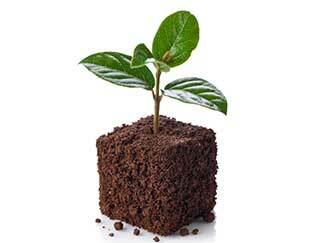 Most plants only need moisture and warmth to germinate, but will need the light to grow once they sprout leaves. Plain fluorescent light bulbs are fine when starting seeds but consider using at least one “grow light” tube if you are going to keep the plants under lights for an extended time (if you are trying to get full-sized plants by transplant time, you’ll need a grow light or a very bright window). Remember that seedlings will quickly become weak and leggy plants if they don’t receive enough light. In warmer regions you can generally skip the lights and indoor placement and place your trays outside to get natural sun and cover them up at night with frost cloth when temperatures drop. You can also move them indoors at night. Seeds generally need a soil temperature above 65º to germinate. If you have trouble maintaining that temperature, consider using a heating mat. Covering your containers with plastic will help hold in moisture and create a humid environment that encourages the seed to germinate.